Jay Hein is a third generation dairy farmer from Mercer County, Ohio. Together with his wife Norma and their son Jake, they care for 130 Ayrshire and Holstein cows and farm 250 acres of crops at Nor-J farms. The Hein family loves what they do — taking excellent care of their cows and producing safe wholesome milk! 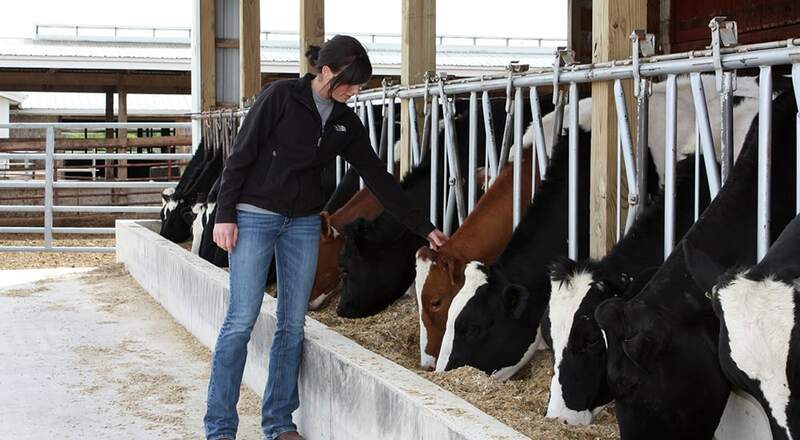 What aspect about your family’s dairy farm do you enjoy the most? Norma: I’m a family person. By being a dairy farmer’s wife I get to be around my husband, my children and grandchildren. We’re down in our milking parlor and the kids are in and out helping, and you get to talk with them. We’re always communicating. Our kids love these cows and enjoy this lifestyle as much as we do. Jay: I don’t think farm size matters. I think it’s just about efficiency. Is there a reason for me to grow this farm? Not in my lifetime, I’m right where I want to be. Are there any plans for the next generation to run this dairy farm? Jake: After high school I came back to the farm and am now farming with a family of my own and work alongside my parents every day. Hopefully I can take over for dad some day. Jay: I think every dairyman likes that idea, but you have to be real about it. If none of them want to stick around, and they pursue other opportunities, that’s fine. I won’t have a problem with that at all.